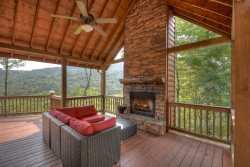 Bear Butte Cabin is a quiet, peaceful cabin in the North Georgia Mountains, with a seat on the front porch just for you! Find your place to escape in this charming 2 Bedroom cabin in the woods. Perfect for a romantic getaway or a small family retreat, Bear Butte will not disappoint. Walk though the front door and immerse yourself in the woodsy scents and cozy atmosphere. The peaceful location of this cabin provides the perfect environment for diving into a good book or even writing one of your own. Listen to the sounds of nature while enjoying a cool summer night on the front porch. This cozy, yet spacious home offers sleeping accommodations fit for royalty and private enough for a couple's weekend with your besties. In the cooler months, the living room fireplace begs you to come and curl up to a good movie and a cup of Joe. In the adjacent kitchen, a fully equipped kitchen awaits; unleash your inner chef and surprise your loved one with an effortless breakfast in bed. Painting the picture for the perfect getaway is proving to be an easy tasks at Bear Butte. Why not find some time to paint yourself in? Cherry Lake; just a short walk from the cabin. They were extremely helpful, right diwn to contacting us the day after we arrived just to see if we needed anything. Even with all the rain, we were comfortable and enjoyed our stay. The young lady was very personable, friendly, and most helpful. We had a great time, walking and just sitting by the fireplace with the little lit Christmas tree. What a beautiful and wonderful experience. Everything a person needs for a relaxing, or for an energetic person, much to do, or just relax. exceptionally clean. I would recommend Southern comfort rentals, they did everything that had to be done, from start of vacation to end. Cabin was furnished beautifully. Thank you, and i hope to rent again for next year. Very simple and smooth check in and out process. The directions were spot on to the cabin. Tiffany was so friendly and accommodating!! Loved the comfort and high end furnishings and decor of this cabin!! Tiffany was very helpful and a pleasure to work with. The cabin was everything we expected based on the online description and photos. The only thing we didn't like was how hard the bed was. We prefer a softer mattress (personal preference), but other than that it was great. Would also have liked to see a larger parking/turn around spot. I drive a full size crew cab pickup truck and it was difficult to turn it around. Beautiful cabin !! friendly staff !! Relaxing environment ! !